Timber decking design build in Seale was a bespoke circular deck that the client had requested for a specific area within their garden. It is made from Yellow Balau hard wood, which we screwed and plugged then sanded to conceal the stainless steel screw heads. We provided full plans and detail drawings to calculate all circular tapering of the wood. 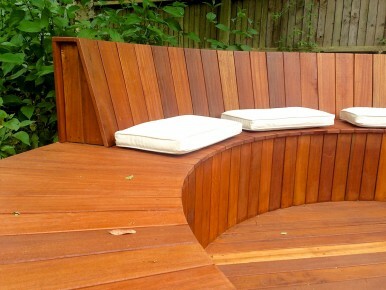 Our superb bespoke designed decking is built and installed by our skilled craftsmen to a refined finish. Why not get in touch and find out what we can do for you. From design to construction we take care of every element of your bespoke decking. Our decking designs are available in a wide range of colours, woods and styles. Whatever you need to tranceform your garden.